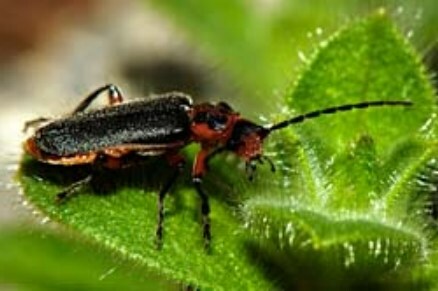 Region: This beetle is common to most of North America. Life cycle: This Beetle will produce one or two generations each year. The fully mature larvae overwinters within the soil. Physical Description: The Downy Leather-wing has a black body bearing short hairs, and the thorax and head are pale. The wing covers are pliable, resemble a firefly, and have long antennae. The overall length is about 1/2 inch. The eggs are yellow and are laid in masses in or on the soil. Gardeners east of the Mississippi are familiar with the Chauliognathus pennsylvanicus, known as the Pennsylvania leatherwing, which has yellowish wings, a large black spot on its thorax, and has spots at the back of both wing covers. Feeding characteristics: This beetle's diet consists of aphids.